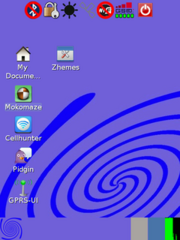 neovento is a [[Debian|Debian for Freerunner]] based [[Distributions|distribution]] which uses [http://lxde.org/ LXDE] and [[Zhone]] on top. It is a [http://freeyourphone.de FreeYourPhone.de] community project. Upcoming neovento 5: Main screen with Zhone. The main concept is the use of LXDE and Zhone which is embedded in the background and the whole is based on Debian/FSO as a subsystem. This distribution has the aim not only to be fully finger friendly, but also to give you a full featured desktop environment.